This Barn Arrow Weather Vane was made entirely in copper. Other possibilities include brass and optional gold and/or palladium leafed accents. The copper globe located where the arrow shaft connects with the vertical copper mounting tube serves as a gusset reinforcing the joint where the horizontal and vertical copper tubing come together. It can be added when the weathervane is going into a high wind environment. You may choose to have this Barn Arrow without it. 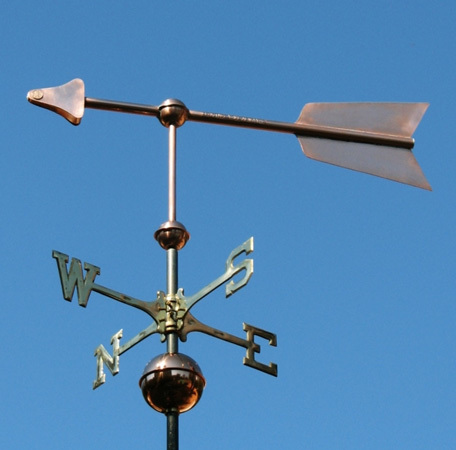 An example of a similar weathervane made without the gusset can be seen on our Traditional Arrow Weathervane webpage. A memorable project for us was an Extra-Large Barn Arrow Weathervane we made for an installation in Texas. Our weathervane was installed on top of a large fiberglas cupola and was hooked up to a mechanism that would then indicate the wind direction on a vertical compass rose on the side of the tower! When the weathervane turned up above the cupola, the arm on the compass rose would move to the appropriate position indicating the wind direction. We all thought this was a great idea! Arrow weathervanes have a long tradition in the New England area and it is no surprise that many of our arrow weathervanes have found their way to homes in that region. Another popular destination for our Arrow weathervanes is Florida. If you are looking for an understated weathervane with a rich history, this may be the one for you. In addition to private residences, we have placed this weathervane in shopping centers, businesses and other public facilities. Arrows predate recorded history and are common to most cultures. They are shafted projectiles that are shot with a bow and consist of a shaft with an arrowhead attached to the front end with fletchings and a notch at the other. In 2010, during an excavation at the Sibudu Cave in South Africa, researchers discovered the earliest direct evidence of human-made arrowheads; 64,000-year-old stone points which may have been shot from a bow. These had remnants of blood and bone, confirming their use in hunting.